Dana R. Hammontree, 62, of Topeka, passed away on April 2, 2019 at her home, surrounded by loving family and friends. She was born August 2, 1956 in Nevada, MO the daughter of Hal and Blanche Schulz. 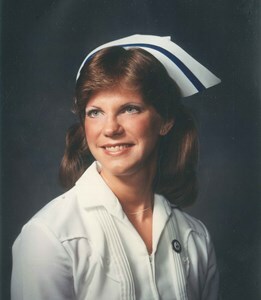 She graduated from Topeka West High School, and went on to receive her BSN and MSN from Washburn University School of Nursing. Dana worked as a Manager Quality Improvement/Disease Management for Blue Cross Blue Shield of Kansas. Dana married Steve Hammontree on November 6, 2009 in Independence, MO. He survives. Other survivors include daughters, Jamie Cowen (Brede), Katlyn Lowe; step-children, Sean Hammontree, Caitlin Wheeler; grandchildren, Layla Lowe, Roxanne Lowe, Brynley Cowen, Max Hammontree, Eli Hammontree, Matti Sanders, Wesley Sanders, Leo Wheeler; and sister, Linda Jackson. She was preceded in death by her parents; and a brother-in-law, Larry Jackson, who was very instrumental in her upbringing. Dana will be remembered as being very crafty, she loved arranging flowers. She loved to cook and bake, especially for others. She always wanted to take care of people, and had an incredibly nurturing soul. Above all else, she treasured spending time with family. A celebration of Dana’s life will be held at 12:00 p.m. on Saturday, April 13, 2019 at Penwell-Gabel Mid-Town Chapel, 1321 SW 10th Avenue, Topeka. The family will host a reception following the service, light refreshments will be served. Memorial contributions may be made to American Cancer Society - Topeka 1315 SW Arrowhead Road Topeka, KS 66604 or Kansas Palliative and Hospice Care, 2611 SW 17th St., suite 205, Topeka, KS 66604. Add your memories to the guest book of Dana Hammontree.